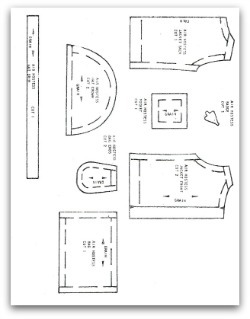 What is the best thing about a fashion doll clothes ebook? If you have been looking for new outfits to sew for teen dolls, you will love this latest offering! It features some of the cutest retro teen fashions available. 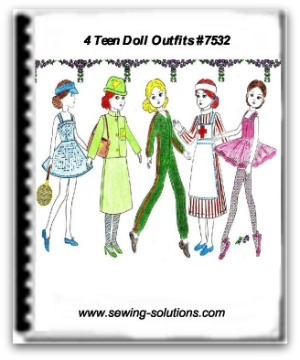 Little girls love their teen dolls and this ebook gives you some great patterns to sew. Teen dolls need their exercise. Scraps of white cotton and small transparent press studs are used to create an adorable tennis halter top and skirt with matching visor. A bit of tulle, satin and ribbon changes the outfit into a dance costume set off with the flair of fishnet pantyhose. Aptly named Fairy Ballerina, the doll will be everything magical with this easy-to-sew outfit. The Air Hostess is a welcome sight when a drink, snack or pillow is required. This classic apparel features a stand-up collar on the long-sleeved, 3-button jacket. Add a matching cap and mid-length A-line skirt. A carry-over bag features a long strap and matching emblem. The emblems are easy to make from gold paper. Add fishnet stockings for the perfect representative of this action-packed job. A few extra touches turn it into a business suit worthy of any stylish young lady. A caring Candy-Striper has a wide white band around her hair, which is gracefully pulled back in a ponytail. The red and white striped dress features a band collar high on the neck. The white apron features wide straps and ties to the back. The finishing stitches are in blue and black, while a red cross fills the bib. A plush jumpsuit with a V-neck opening sets the perfect tone as this ebook shows a girl off for a jaunt through the park. Stripes of a different color start at the neck, travel across the shoulder and continue down the arm, stopping at the gathering of the material at each wrist. A matching stripe starts at the inner arm and extends down the side, ending where the material gathers at the ankle. The pull-on design makes it easy to slip on and remove this casual, fun apparel. 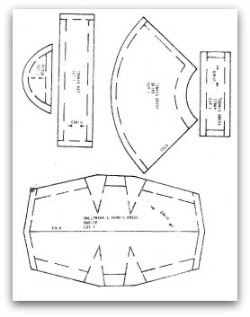 Patterns and complete directions are included to eliminate any guesswork. 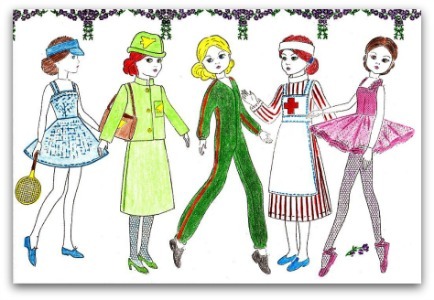 This fashion doll clothes ebook is a perfect way to introduce beginning sewers to instructions, guides and the excitement of creating something beautiful. Longtime seamstresses will appreciate the many ways available to make each set just a bit different from the previous one, eliminating sameness when giving gifts.